A tasty vegetarian supper of cannelloni tubes filled with a broad bean and basil mixture, baked with our ready-made sauces from the chiller cabinet. Preheat the oven to 200°C, gas mark 6. Place the broad beans in a pan of boiling water and simmer for 5-7 minutes, until tender. Drain and refresh under cold running water. Place the broad beans, soft cheese, garlic and basil in a food processor, season with freshly ground black pepper and pulse until combined, but still retaining some texture. 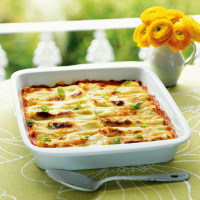 Spoon the tomato and herb sauce evenly across the base of a large gratin or ovenproof dish. Place the broad bean filling in a piping bag or a clean plastic food bag with the corner snipped off and pipe into the cannelloni tubes. Put the cannelloni in the dish on top of the tomato sauce. Spoon the cheese sauce over the top, ensuring the pasta is covered. Sprinkle with the mozzarella. Bake on the top shelf of the oven for 35-40 minutes, until bubbling and golden. Serve with Waitrose Continental Salad. Swap fresh broad beans for frozen. If using fresh pasta sheets, soften them slightly in a bowl of boiling water, drain and blot dry. Spread a little mixture on the edge of each one and roll up. This recipe was first published in Mon Aug 01 01:00:00 BST 2005.